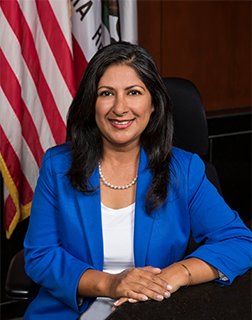 Councilmember Farrah N. Khan is a small business owner and the Executive Director of the Newport Mesa Irvine Interfaith Council. She is a graduate of UC Davis and previously served eight years as a Regulatory Affairs Manager for a major biotech company. She was elected to the Irvine City Council in 2018. Farrah is a PTA member and has served as PTA President for three terms at Deerfield Elementary, PTA Board at Venado Middle School and on the School Site Council at Irvine High. Farrah and her husband are also Legacy Partners with the Irvine Public School Foundation. Farrah has worked extensively with many community organizations in Irvine and Orange County. She has served on the Steering Committee for the Irvine Global Village Festival, is a CERT (Community Emergency Response Team) volunteer with the Irvine Police Department and an active member of the Irvine Rotary Club. She also serves on the faith council for the United Way. Farrah was appointed as a Community Services Commissioner in 2014, where she took the time to get to know the city parks, open spaces, land development, amenities, and employees. She has received numerous awards and recognitions throughout the years which is a testament to her commitment to service. She was also awarded the Community Service Leader Award from the OC Human Relations Commission in 2015. Farrah has been a resident of Irvine for almost 15 years and lives in Greentree with her husband and two sons (ages 14 and 17) and two foster sons (ages 12 and 13).